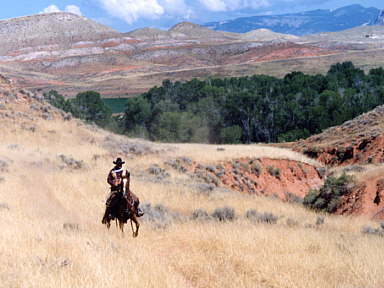 Western riding is a style of riding born from the daily works of the cowboys chasing cattle. Today, the style is practiced not only in the U.S., but has become a style popular worldwide. Not only are western horse shows commonly held in Japan and across the world, but in Japan, many places which cater to the tourism industry use the western saddle on their horses. This is probably due to the western saddle's size, and the sense of security it offers for beginner riders. 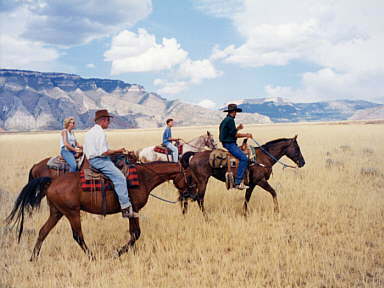 Western riding requires the smart movements necessary to chasing cattle, but because cowboys must also stay aboard their horse all day, it is also a style which is aimed at allowing one to ride for long periods of time, without tiring either the rider or the horse, and a style which is aimed at allowing the horse to move in the most natural form. The horses are trained for this purpose, and the saddle and bits (the pieces placed in the mouth of the horse) as well as other equipment are also made to serve this purpose. Compared with the British style,the more popular style of riding in Japan, (known as 'English' overseas / born of military riding) the birth and manner of approachof western riding is quite deferent, as well as the saddle and other tack, the view of one riding, the style and training of the horse, and what is required of the horse is also quite different. However, both are equestrian sports and thus there are many points of similarity, and though they may look very different, the basics are the same. Western riding of today is very different from the impression you may get from watching a western movie. Western riding of today, though dynamic, requires a rider to understand the mood and state of their horse, and to minutely control each step their horse makes. When mentioning western riding, many may envision the taming of wild horses such as in a rodeo, but western riding is a completely different competition than rodeo. Of course, support personnel at a rodeo such as the Pick-Up Men, as well as Tie-Down Ropers, Team Ropers and Steer Wrestlers show a high level of western riding skill. 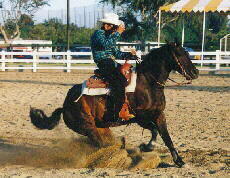 A majority of the horses used in western riding is a type of horse known as the Quarter Horse. Very muscular, their are excellent sprinters, quick movers and very obedient. They were named because they were the fastest horses when it came to racing a quarter mile. Bred from 17th century Spanish horses, they are the first American pure bred. There is an extremely large organization for the horse known as the American Quarter Horse Association (AQHA) which holds western horse shows and races exclusively for quarter horses, and conducts activities to further popularize the quarter horse. 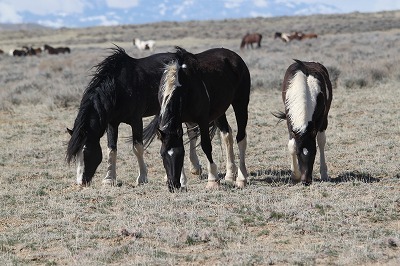 The wild horses of McCullough Peaks range in Northwestern Wyoming can be traced back as far as the early Spanish horses from Mexico in the 1500’s. Some came from the Shoshone Indians who lived in the area from many years. Some came from early settlers who left their stock behind as they moved on. The range covers 190,000 acre of rough land with little water. It is owned and managed by the US Government under the Bureau of Land Management. The herd is made up of approximately 160 horses made up of small families with a dominate stud as the leader. These families are usually 6 to 8 horses and will join others from time to time and then split off again. The smallest family is headed by Utah. Utah is a large black stallion with a full white blaze, he has one mare, Shakira (black and white), Garth a three year old brown and white paint colt and Siska, a one year old black and white colt. Just being with horses is enjoyable by itself, but the view you have aboard a horse is breath taking as well. There is a special feeling one gets, knowing that what they are riding is a living, breathing creature. Going out to the world (known as 'trail riding') ducking through trees, passing through a forest, galloping over hills and splashing through rivers. It's a sight you would never see from a car, and you are able to view the world in a different manner. Unlike other vehicles of travel, you have the pleasure of knowing you are not alone. The refreshing feeling of a gallop can not be enjoyed any other way either. The most enjoyable part of riding horses has to be communicating with the horse. Each horse has their very own personality and feelings. Communicating with those feelings, allows one to get the horse to do as one wishes. Of course, it is not to say that a horse will always do as you want though. By communicating with a horse, you direct the horse in the manner you want them to perform or do as you ask of them. Unlike human communication, you do not use words to communicate with the equine species. Beginning with the reign, your legs, and other parts of your body, you utilize all five of your senses to speak with the horse. Communicating can itself be enjoyable, but the fulfillment you get from feeling as one with the horse once your ability to talk with the horse improves is beyond words. Horses emotions change just as human's do, and just because they obey once, doesn't mean they will do so the next time. Sometimes they become resistant, and then other times they are very submissive. The personality of a horse is unique to each, but this allows you to experience a different type of ride on every horse. Only through communicating with the horse, that is to say understand their mood and emotions, do you begin seeing their personality. Once you are able to do this, the horse in affect will become your partner. You will never grow tired of it. Introducing clubs from around Japan where you can ride western. Those with a homepage are linked. Note: The following are Japanese Publications available in Japan. A magazine exclusively for horseback riding. A bi-monthly publication on sale the 25th every even numbered month. You can get a wide range of information on horseback riding, and though most articles are on British riding, many also feature western riding. A publication on horseback riding. It's an irregular publication, currently volume 15 was the last, and features a different topic every issue. Stories on western riding are not uncommon. The first book in Japan to exclusively feature western riding. A translated version of the Western Horsemanship of the Western Horseman Book series, which is popular in the U.S. It is mainly on Western Horsemanship competition, but is very useful to aspiring western horsemen as well. Highly recomended. Organizations in Japan which work to further popularize horsemanship, and host competitions and other events. Do you have to hold the reigns with one hand? Holding the reigns with the hand opposite your strong hand is a special feature of western riding. The strong arm is kept open for throwing ropes on cattle or doing other work, and that is how this feature evolved. However, you may hold them with both hands if you like. In the higher classes of competition, it is required that reigns be held with a single hand, but in beginner classes or barrel racing, you may use both hands. Using the reigns with a single hand is a hard skill to master, and it is suggested that both hands are used in daily practices. It is often thought that there is no posting in western riding (to post is to rise and site in rhythm with the hoses' gate) but this is a misconception, and there is in fact a form of posting in western riding. It is called the Posting Trot. Legend has it that it is called this because it is a method of riding well suited for the delivery of postal mail. For some reason, it has been said in Japan that there is no posting in western riding. Is the way an American style motorcycle is ridden the same as how a horse is ridden? Curiously, motorcycle magazines in Japan often state that the way an American bike is ridden is the way to ride a horse, but this is not true. When riding an American bike, one positions their legs to the front, and leans their body backward. However, with horses, your posture should be straight up and down. From your head to your shoulders to your hips and down to your heels should form a straight line (knees slightly bent, heels down). Also, another mistake bikers often make when riding a horse is squeezing with their knees. This is known as a knee grip, as is ment to keep the bike stable by squeezing at the knees. However, when riding horses, your legs should be relaxed, with your weight on your rear. Also, when negotiating a curve on a bike, you lean into the curve (lean-with) but when riding a horse, you should try and maintain your body perpendicular to the ground. There is a form of equestrian competition called Western Horse Competition, where competitors dress in cowboy hats and boots to compete. It is a form of competition which grew from the daily works of the cowboys. Today, competitions are held all over the world, including Japan. Many equestrian competitions, large and small, are held all over the U.S., as such, some horses are bought and sold at very high prices. There are many ranches which raise only horses for this type of competition, and horses are raised to compete in different events such as the Pleasure Horse, or the Reigning. Many like Bob Lumis, Al Dunning and other famous horse trainers own and operate such ranches and specialize in raising and training horses for competition.